Poncha Springs was founded on the banks of the South Arkansas River at the northern end of Poncha Pass. The name is part Spanish (a corruption of "poncho," meaning "cape" and "warmth") and part hot springs: there's maybe 99 hot springs coming to the surface in the area. The first homesteaders were John and Minerva Maxwell Burnett in 1865. He was the first Ute Indian Agent in the area, she was probably the first school teacher. An Indian trading post was built in 1866, the first grocery and mercantile in 1868. 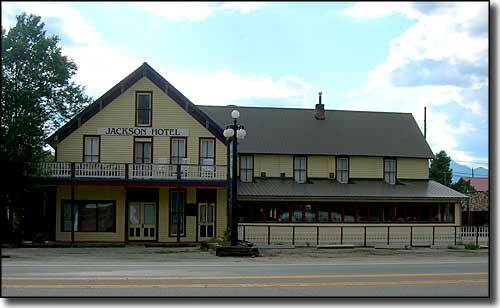 The Jackson Hotel was begun in 1876 and completed in 1878. The railroad arrived in 1880, just before the town became officially incorporated. With the coming of the railroad, the population boomed to more than 2,000. A fire in 1887 destroyed most of the frame buildings in Poncha Springs, including all 17 saloons in town. There is a bit of controversy locally in regards to who was the first white man to learn of the hot springs and pay a visit: was it Lt. Zebulon Pike in 1807 or was it Kit Carson in 1832? Either way, when a stagecoach route was established through Poncha Springs in the early 1870's, many folks laid over for a day or two to check out the hot mineral baths. With the coming of the railroad, the mineral bath business really flourished. The Poncha Springs Hotel was built at the site and folks like President U.S. Grant, "Jeb" McGruder (of Civil War fame) and H.A.W. Taylor (as well as infamous notables Baby Doe Tabor and Jesse James) came to spend some time. The hotel burned down in 1893. Another was built but it, too, burned to the ground in 1903. Miscellaneous folks operated the hot springs property and business until the Town of Salida took over and had the WPA build a pipeline to carry the hot water to Salida. At that point, all the springs were capped with cement and the water has been "owned" by Salida ever since. 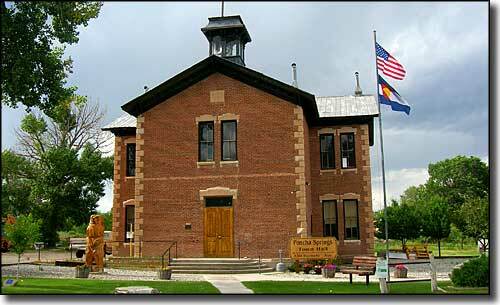 Today, Poncha Springs is a pretty, quiet town at the "Crossroads of the Rockies." Two transcontinental highways meet here (US 50 and US 24). Nearby are 14 mountain peaks that rise above 14,000' and the famous Arkansas River, one of Earth's premier fishing and whitewater rafting streams.